Chelsea Green Publishing Company, 9781603583435, 288pp. 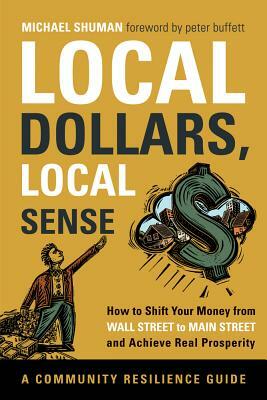 Local Dollars, Local Sense is a guide to creating Community Resilience. Americans' long-term savings in stocks, bonds, mutual funds, pension funds, and life insurance funds total about $30 trillion. But not even 1 percent of these savings touch local small business-even though roughly half the jobs and the output in the private economy come from them. So, how can people increasingly concerned with the poor returns from Wall Street and the devastating impact of global companies on their communities invest in Main Street? A rich resource for both investors and the entrepreneurs they want to support, Local Dollars, Local Sense eloquently shows how to truly protect your financial future--and your community's.